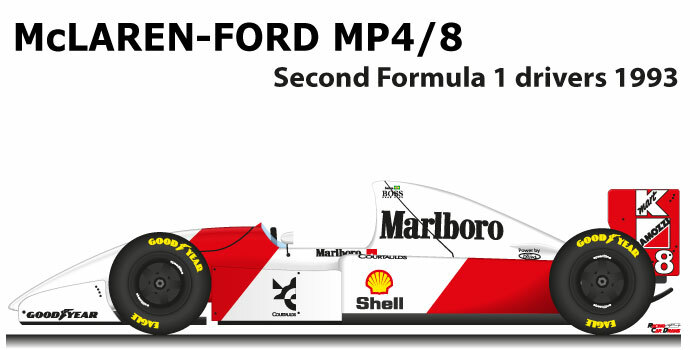 The McLaren – Ford MP4/8 n.8 is a car that participated in the Formula 1 World Championship in 1993. After the withdrawal of the Honda, for the new season the Woking team not finding the agreement with the engine Renault, he opted for the non-powerful Ford engine like the French but reliable engine. Ayrton Senna at the helm of McLaren – Ford MP4/8 n.8 finished second in the Formula 1 World Championship in 1993 behind Alain Prost. During the season the Brazilian driver despite his qualities could not do anything against the French driver’s Williams FW15C. Senna won five races, in Brazil remained on track with the slik tires despite the rain, Doninghton in the wet overtaking five cars on the first lap and won the race, in Monte Carlo got his sixth victory and finally the last two races in Suzuka and Adelaide , the Australian race was the last victory of Ayrton.